Sunday is a happy day for Hong Kong’s domestic helpers. It is their weekly off day, a day to gather with friends, speak in their own language, dance, manicure/pedicure, play bingo/poker cards/mah-jongg, haircut, do cross-stitching, you name it. The Central HSBC headquarters is one of the most crowded spots for their Sunday gathering. 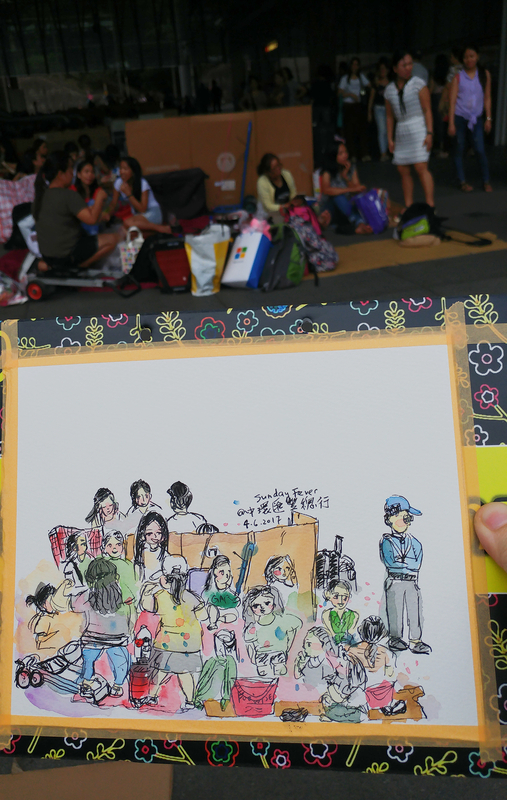 I enjoyed my time being there today to make a sketch, while listening to their dance music, watching illegal hawkers being chased, and feeling the warm summer breeze. Thanks to my friend who accompanied me while I was sketching. We saw a different side of Hong Kong today.